At Lawrenceville Family Dental Care, we understand how busy you are, and if you have multiple people in your family, how difficult it can be to schedule dental appointments. We make it a priority to keep our patients in mind in all that we do, including making it as convenient as possible to schedule appointments. Our dental practice in Lawrenceville is open five days a week with convenient hours each day. Your busy schedule does not include time set aside for wasting, and ours does not either. Lawrenceville Family Dental Care is committed to staying on schedule throughout each day in order to meet your scheduling needs as conveniently as possible. Whether you schedule your appointments months in advance or you call for an appointment next week, you can expect little to no wait time when you come in for your appointment. 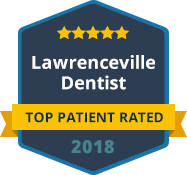 At Lawrenceville Family Dental Care, you can expect exceptional dental care with the convenience and proficiency you deserve. Some dental appointments just cannot wait – especially if your dental issues involve pain or any type of emergency. Lawrenceville Family Dental Care reserves openings in our schedule each day to accommodate patients who need same day dentistry care. Any time you have a dental emergency where a tooth has been chipped, broken, or knocked out it needs to be seen right away for the best chance of restoration. Lawrenceville Family Dental Care is proud to offer same day dentistry for patients who need to be seen right away. Our scheduling convenience extends to all of our patients, and we will do our best to make sure that you are seen when you need to be seen. Please contact us right away with any dental emergency so that we can attend to your needs as quickly as possible.